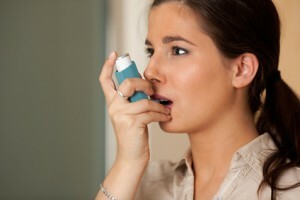 Frequency and severity of attacks determine whether asthma qualifies as one of the Social Security disability injuries. Asthma occurs when airways within the body narrow and become inflamed. Common symptoms include wheezing, shortness of breath, coughing, and a feeling of tightness in the chest area. According to the National Institutes of Health, more than 25 million people in the United States, including seven million children, suffer from this chronic disease. If you are one of them, you may wonder whether asthma is among the types of disabilities that qualify for Social Security disability benefits. Researchers have not yet discovered what causes asthma but they believe that an interaction of certain environmental and genetic factors is to blame. Though people of any age can be affected, onset typically occurs during childhood. A primary care physician or a respiratory specialist renders a diagnosis based on a physical examination, a lung function test and other medical testing, and family history of allergies or asthma. Asthma symptoms and asthma attacks range from mild to serious, with the most severe attacks sometimes causing respiratory failure. Frequency and severity of attacks determine whether asthma qualifies as one of the Social Security disability injuries. Though most asthma sufferers do not qualify for these disability benefits, others whose conditions are not effectively treated with medication may be approved for disability payments. To qualify, the applicant must experience a severe asthma attack a minimum of six times per year or at least once every other month. The attack must last for at least one day and require emergency room or hospital treatment. Extended inhalation sessions, antibiotics administered intravenously, and intravenous bronchodilators are common treatments. Medical records should include details regarding each attack and types and durations of treatments. Patients with both asthma and chronic bronchitis may qualify for disability benefits based on breathing or lung function test results. The Social Security Administration (SSA) examines medical records covering at least a 12-month period. Adult applicants who do not qualify based on the definition of asthma used by the SSA may receive benefits based on a residual functional capacity (RFC) assessment. An RFC includes physician-recommended job restrictions due to asthma diagnosis. To learn more about when asthma qualifies as one of the Social Security disability diseases, patients should consult attorneys specializing in Social Security disability cases. These lawyers will explain the entire disability application process including factors the SSA considers when issuing approvals. Social Security disability lawyers also help clients complete disability applications and gather documentation the SSA needs to render its decision. Writer for Legal Matters including Social Security Disability, Bankruptcy, Family Law Matters, and DUI.